Disney research scientists have come up with new technology which can create 3D eyes with just a single photo or a facial scan. Since it uses the parametric model of the eye, this new method uses less time and equipment's than the existing models. "This new method of eye capture enables us to create highly realistic animations for films, games and medical applications and to do so with as little fuss as possible," said Markus Gross, vice president at Disney Research. “After decades of research, facial capture technology is now so advanced that it can be difficult to distinguish between digital faces and real ones,” added Thabo Beeler, senior research scientist at Disney Research. Since they use a parametric eye model, it's easy to give many variations to the eyes, you make the eyes look blood shot or fatigued, just by using the simple algorithm. By using this method, the eye colors, pupil dilation, enlarged veins is made possible to create a story-line which is much sought after in the film industry. To achieve the parametric model, using the traditional methods, 30 pairs of eyes were captured with the use of high resolution cameras. This gave the scientists sufficient insight into understanding different types of eyes, shapes and all other characteristics of a typical eye. 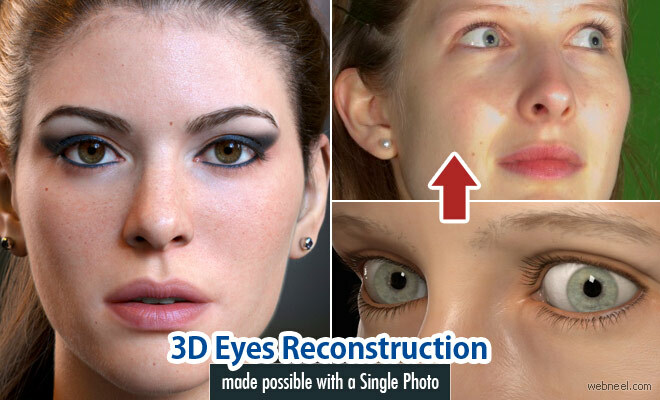 What's so special about this model is that, it creates the left eye and a mirror image is created for the right eye. Well it sound's so simple to do, but actually this particular model uses three components. “A single all-encompassing parametric model is not practical. For this reason we compose a model built from three separate components, namely an eyeball model that represents the low-frequency variability of the entire eyeball shape, an iris model that represents the high-resolution shape, color and pupillary deformation of the iris, and a sclera vein model,” the researchers explain.